Not one for alternative truths from the get go (I just called it BS in those simpler days), I have to admit I bridle a bit at anything billing itself The World of anything. It's a big place, you know, the world. Pretty hard to encompass. Mighty ambitious of you. 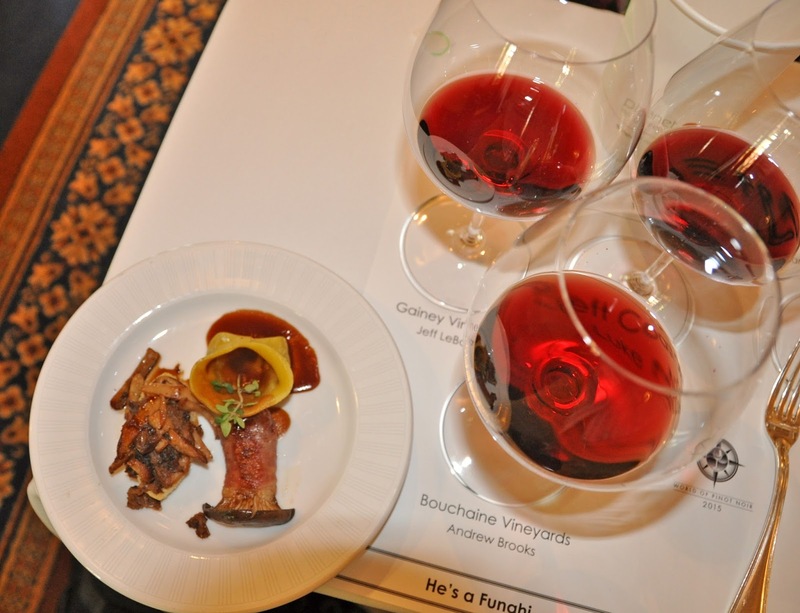 And while the photo I led with is from one of the seminars a couple of years back, I want to spend this post discussing how best to navigate the two major tastings as opposed to attending the special events, which I'll get to next week. After all, I figure someone with a budding interest and more than a budding wallet (you sort of need one in full bloom, as tasting tickets start at $85), would want to taste up more than sit and learn. But at 100 wineries a day with 2-4 wines open each, you have to be selective or else you'll end up discovering a word 100x stronger than regret. Decision 1: wide or deep? Sure, you can just stumble around from table to table without a plan, and you will still have wonderful wines - it's pinot noir, after all. Or, you can opt for a theme. It's probably easiest to focus, to go with a region - hunt out only the Mendocino/Anderson Valley producers, since you like rose-leaning pinot, say - or if you're from Santa Barbara, stick close to home. (Even though you might choose to specialize and taste only Sta. Rita Hills or Santa Maria Valley.) Or maybe do only the roses, as producers at this event often bring their roses of pinot noir as spring is just around the corner, if that corner is wetter than it's been in years. Luckily the WOPN website let's you sort wineries by location, so you can be all set. Or, go deep, and try some comparison shopping - perhaps a Sta. Rita Hills vs. Santa Maria Valley taste-off. Some wineries can help by having wines from both locations, even. Decision 2: what you know or what you don't? It's also good to decide how adventurous you feel. There's nothing wrong that visiting all your old favorites for on Friday, for instance, that could mean Alma Rosa, Brewer Clifton, Dragonette, and that's just the ABCD and we haven't got into SLO County, even. Or, you could only drink wines you've never drunk before, and you will be able to do that, too. Remember, 100 producers a day. Part of me wanted to make recs, but there are too many good winemakers at this event. Just enjoy! And be sure to eat some food and drink water, too. Hydration today will be less headache tomorrow.